The world's biggest free seafront air show returns in August with days of spectacular flying and it's all FREE! 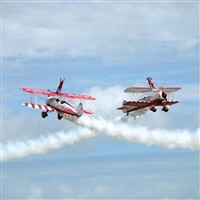 Featuring the best of the RAF and international display teams across the eight miles length of seafront and over national beauty spot Beachy Head. The event also includes children's entertainment areas, arena events, evening concerts, helicopter rides, and a military exhibition area.